Implantium is run for dentists by dentists and offers unrivalled experience in the field of implantology. We’re totally committed to innovation, quality and service, and our fresh approach is revolutionising the UK dental implant market by offering dentists a top quality product at up to 40% less than other implant providers. Meaning that they can pass on these fantastic benefits to you! Our dedicated dental professionals offer a vast amount of implant experience within general practice, as well as widespread knowledge and expertise. 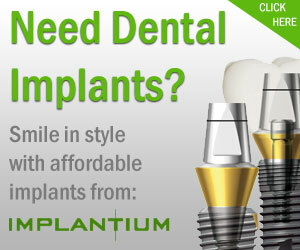 Implantium implants are produced by a company called Dentium, which has an extensive commitment to research and development, as well as to training and education. It is this innovation and total commitment to quality that makes them the leader in their field and, it’s why we are proud to supply their products. We not only provide dentists with a fantastic product at a hugely cost-effective price, but all of this is backed by excellent customer support – so you can be assured of a friendly, professional and dedicated service at all times.